Calculate the inductance of an inductor. Calculate the energy stored in an inductor. Calculate the emf generated in an inductor. Induction is the process in which an emf is induced by changing magnetic flux. Many examples have been discussed so far, some more effective than others. Transformers, for example, are designed to be particularly effective at inducing a desired voltage and current with very little loss of energy to other forms. Is there a useful physical quantity related to how “effective” a given device is? The answer is yes, and that physical quantity is called inductance. Mutual inductance is the effect of Faraday’s law of induction for one device upon another, such as the primary coil in transmitting energy to the secondary in a transformer. See Figure 1, where simple coils induce emfs in one another. where is defined to be the mutual inductance between the two devices. The minus sign is an expression of Lenz’s law. The larger the mutual inductance , the more effective the coupling. For example, the coils in Figure 1 have a small compared with the transformer coils in Chapter 23.7 Figure 3. Units for are , which is named a henry (H), after Joseph Henry. That is, . where is the same as for the reverse process. Transformers run backward with the same effectiveness, or mutual inductance . Figure 2. The heating coils of an electric clothes dryer can be counter-wound so that their magnetic fields cancel one another, greatly reducing the mutual inductance with the case of the dryer. where is the self-inductance of the device. A device that exhibits significant self-inductance is called an inductor, and given the symbol in Figure 3. The minus sign is an expression of Lenz’s law, indicating that emf opposes the change in current. Units of self-inductance are henries (H) just as for mutual inductance. The larger the self-inductance of a device, the greater its opposition to any change in current through it. For example, a large coil with many turns and an iron core has a large and will not allow current to change quickly. 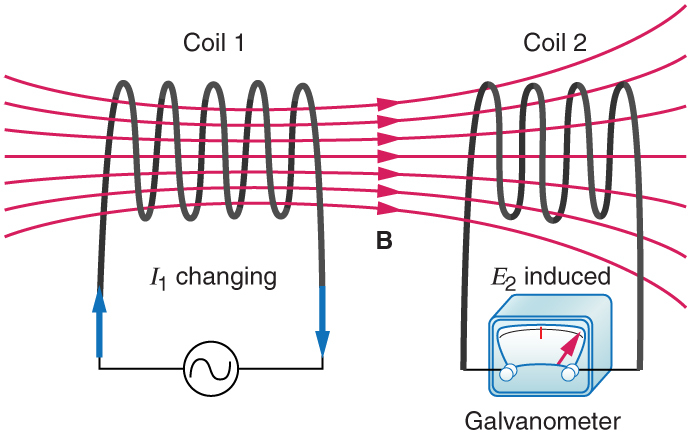 To avoid this effect, a small must be achieved, such as by counterwinding coils as in Figure 2. A 1 H inductor is a large inductor. To illustrate this, consider a device with that has a 10 A current flowing through it. What happens if we try to shut off the current rapidly, perhaps in only 1.0 ms? An emf, given by , will oppose the change. Thus an emf will be induced given by . The positive sign means this large voltage is in the same direction as the current, opposing its decrease. Such large emfs can cause arcs, damaging switching equipment, and so it may be necessary to change current more slowly. Figure 4. Through rapid switching of an inductor, 1.5 V batteries can be used to induce emfs of several thousand volts. This voltage can be used to store charge in a capacitor for later use, such as in a camera flash attachment. This equation for the self-inductance of a device is always valid. It means that self-inductance depends on how effective the current is in creating flux; the more effective, the greater is. This is the self-inductance of a solenoid of cross-sectional area and length . Note that the inductance depends only on the physical characteristics of the solenoid, consistent with its definition. Calculate the self-inductance of a 10.0 cm long, 4.00 cm diameter solenoid that has 200 coils. This is a straightforward application of , since all quantities in the equation except are known. This solenoid is moderate in size. Its inductance of nearly a millihenry is also considered moderate. One common application of inductance is used in traffic lights that can tell when vehicles are waiting at the intersection. An electrical circuit with an inductor is placed in the road under the place a waiting car will stop over. The body of the car increases the inductance and the circuit changes sending a signal to the traffic lights to change colors. 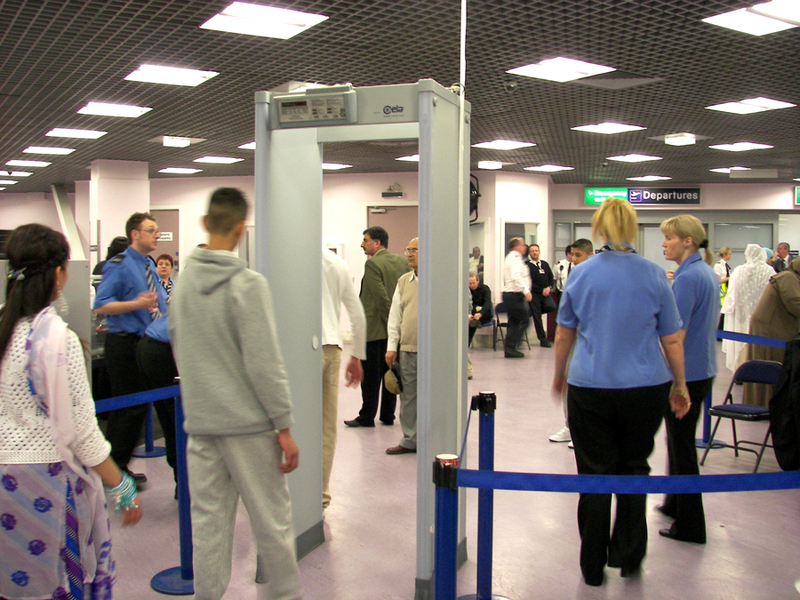 Similarly, metal detectors used for airport security employ the same technique. A coil or inductor in the metal detector frame acts as both a transmitter and a receiver. The pulsed signal in the transmitter coil induces a signal in the receiver. The self-inductance of the circuit is affected by any metal object in the path. Such detectors can be adjusted for sensitivity and also can indicate the approximate location of metal found on a person. (But they will not be able to detect any plastic explosive such as that found on the “underwear bomber.”) See Figure 5. This expression is similar to that for the energy stored in a capacitor. How much energy is stored in the 0.632 mH inductor of the preceding example when a 30.0 A current flows through it? The energy is given by the equation , and all quantities except are known. This amount of energy is certainly enough to cause a spark if the current is suddenly switched off. It cannot be built up instantaneously unless the power input is infinite. Inductance is the property of a device that tells how effectively it induces an emf in another device. Mutual inductance is the effect of two devices in inducing emfs in each other. where is defined to be the mutual inductance between the two devices, and the minus sign is due to Lenz’s law. where is the same mutual inductance as in the reverse process. Current changes in a device induce an emf in the device itself. Self-inductance is the effect of the device inducing emf in itself. where is the self-inductance of the inductor, and is the rate of change of current through it. The minus sign indicates that emf opposes the change in current, as required by Lenz’s law. The unit of self- and mutual inductance is the henry (H), where . where is its number of turns in the solenoid, is its cross-sectional area, is its length, and is the permeability of free space. 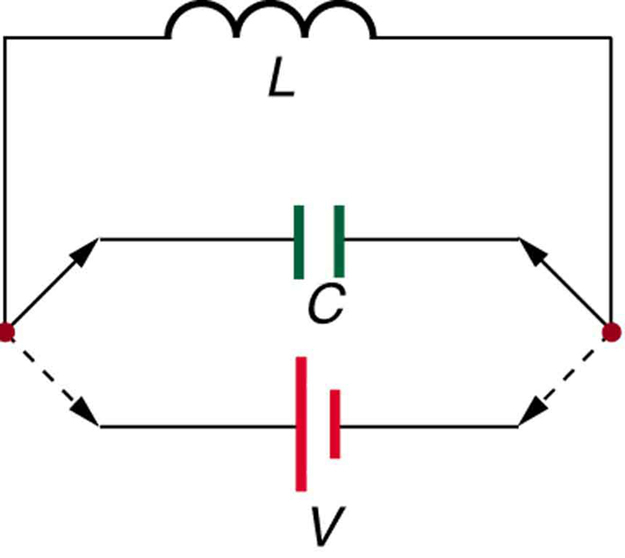 1: How would you place two identical flat coils in contact so that they had the greatest mutual inductance? The least? 2: How would you shape a given length of wire to give it the greatest self-inductance? The least? 3: Verify, as was concluded without proof in Example 1, that units of . 1: Two coils are placed close together in a physics lab to demonstrate Faraday’s law of induction. A current of 5.00 A in one is switched off in 1.00 ms, inducing a 9.00 V emf in the other. What is their mutual inductance? 2: If two coils placed next to one another have a mutual inductance of 5.00 mH, what voltage is induced in one when the 2.00 A current in the other is switched off in 30.0 ms? 3: The 4.00 A current through a 7.50 mH inductor is switched off in 8.33 ms. What is the emf induced opposing this? 4: A device is turned on and 3.00 A flows through it 0.100 ms later. What is the self-inductance of the device if an induced 150 V emf opposes this? 5: Starting with , show that the units of inductance are . 6: Camera flashes charge a capacitor to high voltage by switching the current through an inductor on and off rapidly. In what time must the 0.100 A current through a 2.00 mH inductor be switched on or off to induce a 500 V emf? 7: A large research solenoid has a self-inductance of 25.0 H. (a) What induced emf opposes shutting it off when 100 A of current through it is switched off in 80.0 ms? (b) How much energy is stored in the inductor at full current? (c) At what rate in watts must energy be dissipated to switch the current off in 80.0 ms? (d) In view of the answer to the last part, is it surprising that shutting it down this quickly is difficult? 8: (a) Calculate the self-inductance of a 50.0 cm long, 10.0 cm diameter solenoid having 1000 loops. (b) How much energy is stored in this inductor when 20.0 A of current flows through it? (c) How fast can it be turned off if the induced emf cannot exceed 3.00 V? 9: A precision laboratory resistor is made of a coil of wire 1.50 cm in diameter and 4.00 cm long, and it has 500 turns. (a) What is its self-inductance? (b) What average emf is induced if the 12.0 A current through it is turned on in 5.00 ms (one-fourth of a cycle for 50 Hz AC)? (c) What is its inductance if it is shortened to half its length and counter-wound (two layers of 250 turns in opposite directions)? 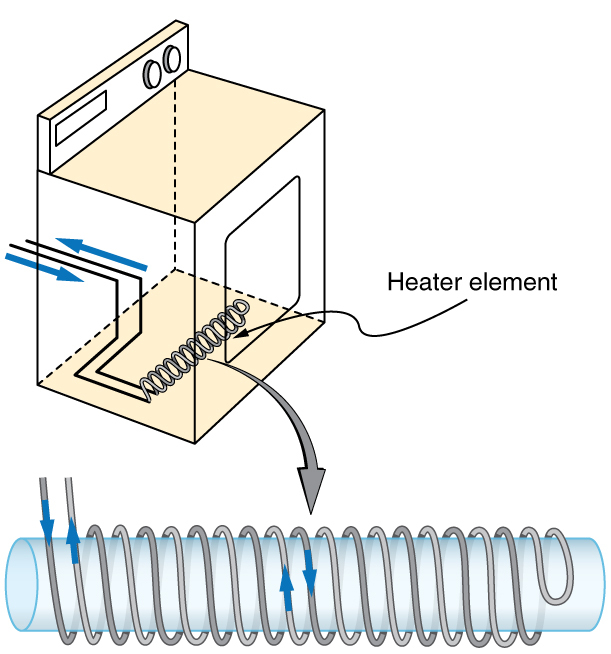 10: The heating coils in a hair dryer are 0.800 cm in diameter, have a combined length of 1.00 m, and a total of 400 turns. (a) What is their total self-inductance assuming they act like a single solenoid? (b) How much energy is stored in them when 6.00 A flows? (c) What average emf opposes shutting them off if this is done in 5.00 ms (one-fourth of a cycle for 50 Hz AC)? 11: When the 20.0 A current through an inductor is turned off in 1.50 ms, an 800 V emf is induced, opposing the change. What is the value of the self-inductance? 12: How fast can the 150 A current through a 0.250 H inductor be shut off if the induced emf cannot exceed 75.0 V? A 25.0 H inductor has 100 A of current turned off in 1.00 ms. (a) What voltage is induced to oppose this? (b) What is unreasonable about this result? (c) Which assumption or premise is responsible? (d) No, it is not surprising since this power is very high. 23.9 Inductance by OpenStax is licensed under a Creative Commons Attribution 4.0 International License, except where otherwise noted.